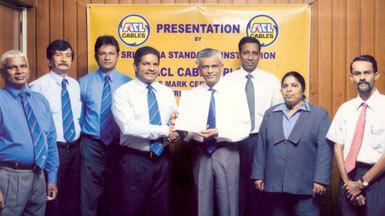 ACL manufactured Armoured Cables for the first time in Sri Lanka in 1984 livering a huge benefit in quality and price to local industrialists and the engineering fraternity. Throughout the past 50 years, ACL Cables has maintained and improved quality of their range of wire products, acquiring a 45 percent share in the Cable and Conductor manufacturing market. Catering to general household and industrial requirements, ACL Cables PLC strives to provide customers with technologically advanced and high quality products that are not only safe but which are durable, this is why ACL introduced a range of fire retardant cables in 2005 having established a comprehensive laboratory for fire tests. ACL Cables (PLC) exports products to many countries including Australia, New Zealand, Maldives, India and the African Continent including Mauritius. Among many awards won, securing the topmost award of the Asia Pacific Quality Organisation World Class Award in 2008 beating 46 countries can be classed as the crowning glory of ACL - which every Sri Lankan can be proud of.